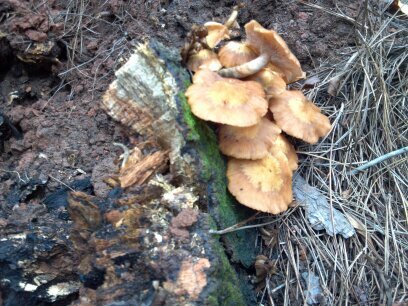 Armillaria, or honey fungus, is a genus that covers several species of soil born root decay fungi. The common name is derived from the yellow-orangish mushrooms depicted in the pictures below. Armillaria causes a white rot, which like Inonotus (as described in an earlier post) begins by breaking down lignin and in advanced stages breaks down cellulose and hemicellulose. 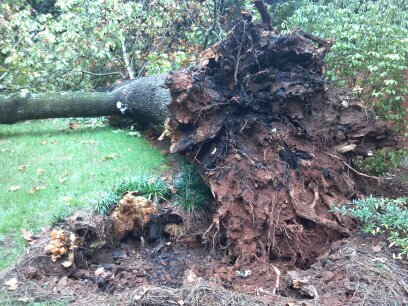 While white rots are usually described as slow moving decay organisms, Armillaria is noted as being more aggressive in its attack on tree structure. Armillaria gets its other common name 'black shoe string fungus' from the black mycelial fans it puts out to devour wood. 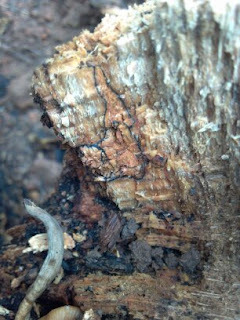 Unlike other structural root decay fungi, Armillaria also can affect the vascular system of the tree, so early signs of infection may be noticed by a decrease in tree vigor and poor tree health. The pictures below show what happens to trees in advanced stages of Armillaria infection. The yellowish orange mushrooms of Armillaria protruding from the bark on the lower stem of the tree. Notice the tell tale black mycellium penetrating the wood fibers of it's victim.